This record was found among some of the letters from my grandmother Pearl Haslam Redford. James Holt Haslam was her grandfather. 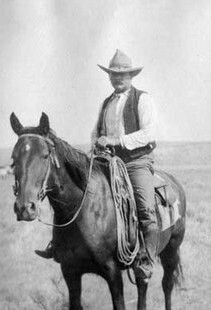 One of these was the renowned “Pony Bob” (Robert H. Haslam) of the Pony Express who made one ride 308 miles without leaving the saddle. The regular assignment was for each rider to carry the mail from sixty to seventy-five miles before being replaced by another rider. But Indians had killed the men at the next station. He passed the burning ruins of not only that station but two others before he found a rider to take his place. Incidentally Buffalo Bill’s most famous ride was 321 miles but he stopped for meals and was obviously not under pressure and danger. Therefore I rate Bob Haslam the more noteworthy of the two. Only one other Pony Express Rider exceeded the two rides mentioned above to make the greatest record in that history making company. He was Thomas Dobson of Utah who traveled 322 miles. These three rides will thrill readers for all time and the men who made them are now well known names to every boy who loves to read exciting stories of the old west in pioneer days. Another great event which many will remember was “the Ride From Ghent to Dix” as beautifully told in the old fifth reader. But for distance and speed even it did not compare with the pony express Riders mentioned above. And then there was the ride of Paul Revere immortalized by Longfellow. But that ride was less than twenty-five miles and really no great feat of horsemanship. But being the first signal for the successful American revolution every school boy in North America has heard or probably will hear about it. By contrast with these much publicized and well known riders the greatest horse-back rider of all time, to my knowledge, has never received more than the meagerest recognition, the barest mention in history books and no publicity in the 103 years since it was made. Why? Because it was connected with the darkest blot on the history of Utah. An event which most of our historians have studiously avoided writing about and in suppressing the history of the event itself have inadvertently killed the chance for recognition for a feat of horsemanship and rider endurance unexcelled anywhere at any time. The man was James H. Haslam. The setting was Mountain Meadows in southern Utah. A band of Indians and Whites were threatening to murder 135 men, women and children of a wagon train from Arkansas headed for California. The emigrants had been making themselves obnoxious to both Indians and White settlers by threats and stealing until hatred had risen to fever pitch. The only hope of stopping the massacre was to get word to Brigham Young more than 300 miles away at Salt Lake City, and an order back from him. When appointed to do so by Bishop Isaac C. Haight, James H. Haslam made that ride to carry a letter and get a reply by relaying horses with what he could pick up without notice along the way and the country was new to him. With the exception of a few hours rest the first night and when he arrived at Salt Lake City which President Brigham Young personally ordered him to take he made that ride of more than 600 miles only stopping long enough to change horses. With no route laid out and planned in advance, no pay for the trip. 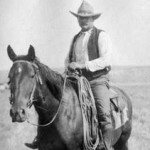 His meals were what he could eat while someone changed the saddle from one horse to another. Leaving September 1857 he arrived in Salt Lake City September 10 and was back at the starting point Sunday 13 September, 62 hours from the time he left. Indians all along the way tried to delay him. But alas too late! The massacre took place before he got back with orders which may have prevented it. The message, “Go with all speed, spare no horse flesh. The emigrants must not be meddled with, if it takes all Iron County to prevent it. They must go free and unmolested.” Signed: Brigham Young, Governor of Utah. The massacre occurred at the same time Johnson’s Army was approaching Salt Lake City and Utah people were focusing their attention on that problem and were in a hostile mood. That is one reason why James H. Haslam’s famous ride received little of the deserved recognition at the time. There were between fifty and sixty whites and several hundred Indians in the party which surrounded the wagon train camp. When two emigrant men slipped out into the night and were intercepted by three white men who killed one of them it was decided that since the one who escaped would spread the word that the white settlers were spearheading the attack, that none of them old enough to remember anything should be allowed to stay alive to report. The massacre was then carried out without waiting for Brigham Young’s direction to be brought back by Haslam. John D. Lee who headed the attack, and was also Indian agent, was excommunicated. Many years later and after two trials was convicted and executed for the crime. Comprehensive History of the Church Vol. 4, age 156. In order that it might be accomplished without risk to themselves it was decided to decoy the emigrants from their fortified camp, disarm them and treacherously put them to death. The conception was diabolical, the execution was horrible and the responsibility for both must rest upon those men who conceived and executed it. — A flag of truce was sent to the emigrant train carried by William Bateman — The terms were that the emigrants give up their arms, that the wounded be loaded into the wagons followed by the women and larger children, the men of the company in single file coming after them. On condition of such surrender the white settlers were to give the emigrants safe conduct back to Cedar where they would be protected until they could continue their journey to California in safety. The surrender was made and the march toward Cedar began — The signal agreed upon was given and the Mountain Meadow massacre was made a horrible fact of history. From 115 to 120 men, women and children were slain and then given an imperfect burial. The 17 babies and very small children spared were distributed among the settlers — later Congress having appropriated the sum of $10,000.00 for their recovery and restoration — most of them were received and cared for by a child’s orphanage in St. Louis. The property of the emigrant train was seized upon by both Indians and white men some of it being sold in Cedar at public auction.